The first time I ever saw the Pacific it glistened steely white under a strong afternoon sun. In hindsight, I could pretend that I fully appreciated my virgin glimpse of the world’s largest ocean, but I was dusty, disheveled and twenty two years old: I paused only briefly to acknowledge my arrival at a coastline that, until then, signified the furthest I’d ever strayed from home. A long truck ride had taken us south from Cuenca to cross the border, where the illegal trade of everything, from drugs to huskie dogs boomed. A contrast to the harsh reality of border politics is arguably South America’s biggest boast: its rapidly changing vistas. Ecuador’s hinterland gradually gave way to flatter ground and once over no man’s land, Peruvian banana plantations lined the road for an hour or so. When I next opened my eyes from a deep dose, vultures circled arid desert escarpments and to my right stretched shimmering sea. Northern Peru’s town of Punta Sal sits on the edge of the country’s long dip into the Pacific. For locals, deep-sea fishing in traditional reed kayaks still puts food on the table. For travellers, the coastline is also the main draw. Out of town, we pitched camp in the sand only meters from the shore. We had the entire beach to ourselves and the only interruption of the natural landscape was a cluster of picnic tables under wooden rafters that served as a bar. As the daylight faded, sharp silhouettes of our canvass tents framed an oversized sun plunging into the ocean. Crabs scuttled into their rocky homes and night arrived. 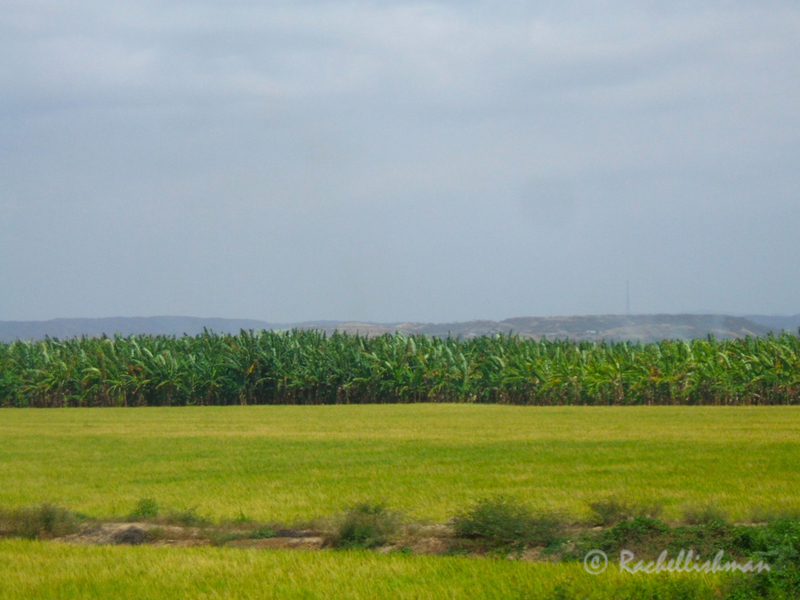 Peru’s banana plantations from the truck window. A green welcome to my second South American country! By the time the moon rose fully, our campfire’s flames were casting long shadows across the sand, while a single electric light formed an orb over the quiet bar’s porch. Following a camp dinner and flapping efforts that had now become more efficient, we indulged in Cuba Libres and extremely clichéd guitar playing. Encouraged by the soothing rum, I noticed that life had slowed since our arrival. Punta Sal had swiftly put pay to my full-throttle visit to Peru, its many suns and moons drawing us into their rhythm. Also encouraged and warmed by the rum, I decided to swim. To my delight, as I swept my arms in a slow breaststroke, the charcoal water suddenly glowed an ethereal green. Phosphorescence danced around me as if it could sense my high spirits. I became extremely aware of the absolute privilege it was to be there, with one of earth’s smallest creatures. I woke up sweating in pre-dawn warmth and lunged for the tent opening. Daylight was still only a silent, heavy haze. I focused on the sounds of lapping water, the clack clack of the now familiar crustaceans and the occasional rude interruption of an excitable pelican. My day was just beginning and I had one glorious task: To walk the shoreline collecting firewood before dusk returned. I recently listened to a talk by travel writer Pico Iyer entitled The Art of Stillness. In it, he reminds us of the importance of reclaiming our days amid the constant motion of modern life, where hours revolve around answering emails, hitting deadlines or feeling guilty for missing important events. Punta Sal was the place that taught me the importance of stillness. 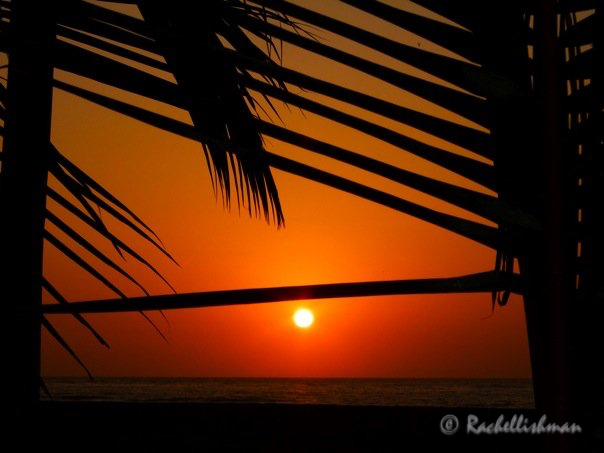 Its suns were the perfect pause in an endless bustle that epitomized my time in South America. It still serves to remind me that however we decide to spend our time, the sun will rise, the sun will set and inevitably, the days will pass. Great post, and love the advice given in your concluding paragraph. We’re still missing SA now. Loving this peaceful and inspiring post.This line really jumped out at me ‘the importance of reclaiming our days amid the constant motion of modern life’. I definitely need to focus on this. Thank you! What a beautiful experience and you’ve recorded it so well I felt like I was there with you. Beautiful reminder, Rachel. Slowing down is one thing, but stopping long enough to absorb the stillness is important for the soul. I confess I have to work on this. Thanks Lynne. I’ve just update the post with a link to Pico Iyer’s talk which provides an interesting perspective for those of us insistent on marching across the globe continually. He suggests that ‘going nowhere’ is just as important as ‘experiencing somewhere’ – an unusual concept for someone who makes their living from travel! Thanks for the link. I look forward to creating a still moment to savor his words. Great post Rachel, – and thank you for the link to Pico Iyer’s speech for TED. I love the way you describe the life in Punta Sal and your camping experience, by being away from modern technology and daily life. We need those moments, the break and being away from social media, office e-mails which is nowadays changed into a small device called mobile phone….very scary.